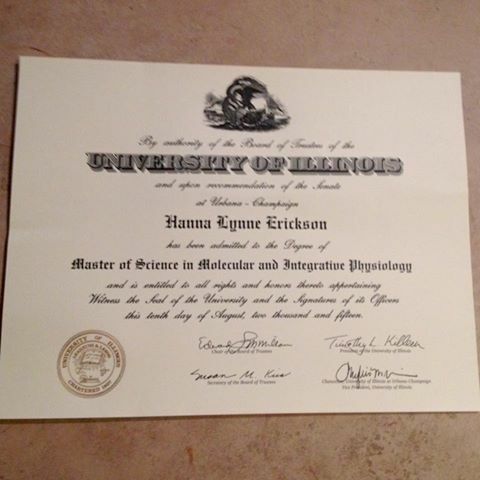 So, in my little absence from blogging, I went out and got my masters degree. Cool, right? While I was officially notified that I would be awarded my degree in May and technically “graduated” in August, I didn’t get this fancy piece of paper until mid-September when I finally let everyone know. Alas, my absence from blogging made posting this a little bit less of a priority, but I’m hoping that by writing this now, I will be able to get myself back into that whole writing-for-fun (fun? yes fun) thing. First of all, you may be wondering why get a masters if I’m getting a Ph.D. Yes, some people get masters before they apply to a Ph.D. program, but I’m already signed up for the long run. Fortunately, my department thinks it’s nice to award their students masters degrees after completion of the course requirements, recommendation by the advisor to continue as a Ph.D. candidate, and successful completion of written and oral Ph.D. candidacy qualification exams. The course requirements are usually completed by the time of the qualification exam in the spring of the second year. Even though I switched labs after 8 months, which put me behind in my research, I still was able to complete this exam on time. The research aspect is important because our qual exam involves writing a research proposal based on our current work (which requires generating a sufficient amount of data) and orally defending said proposal. Fortunately, just before writing my proposal, I helped my prof write a larger NIH research proposal on my project, which I then was able to take parts of (aka the parts that I primarily wrote) and incorporate them into my proposal. It was a great experience to become more familiar with proposal writing, which helped me write mine (grad students, if you ever get a chance to do this, definitely do it!) I gave myself a month to devote myself to writing my proposal and finishing up some experiments to use as preliminary data and was pretty satisfied with the result. Way to go, Hanna! We’re really proud of you. I’m so glad I came across your website. I am applying for MD/PhD programs next cycle and I am interesting in medical oncology and immunotherapy work as well! I’ve enjoyed reading about your journey and your essay examples were extremely helpful! Thanks again and good luck with everything!